Earth is full of bizarre landscapes. Some are land formations moulded over thousands of years, while others are human-made creations that have altered the planet in strange ways. From the bubbling lava lakes of Ethiopia, to a lake that has been nestled in the desert for 2,000 years, here are 29 landscapes that are so incredible, it's hard to believe they're real. Near the city of Torrevieja in Spain lie two salty and very pink lakes called Las Salinas de Torrevieja. The colour is said to be caused by algae that releases a red pigment under certain conditions. The Door to Hell in Turkmenistan has been burning its flames since 1971. Somehow, the hole continues to burn since it was accidentally drilled into by geologists. In the province of Denizli in western Turkey, the naturally terraced thermal springs of Hierapolis-Pamukkale date as far back as the second century BC. Formed by calcite in the water, the hot springs look like stunning white clouds. The Wai-O-Tapu Thermal Wonderland in New Zealand has been sculpted from thousands of years of volcanic activity. Considered New Zealand's most colourful and diverse geothermal attraction, the site features bubbling mud pools, mineral terraces, and geysers. Tanzania's Lake Natron is known for its deep red hue. Its rich colour comes from algae and salt-loving organisms, and it fascinatingly draws millions of flamingo visitors from June to November. In Geneva, travellers can witness the majestic sight of two rivers colliding with one another. The source of the Rhône river is the Rhône Glacier, while the Arve River is fed by glaciers in the Chamonix valley. When the two bleed into one another, it makes for a stunning sight. The Danakil Depression, in the northeastern corner of Ethiopia, is one of the hottest places on the planet, with temperatures reaching as high as 145 degrees Fahrenheit (62 degrees Celsius). With two active volcanoes, a bubbling lava lake, geysers, acid ponds, and several mineral deposits, the setting looks like something from another planet. The rice terraces of China's Yunnan province are carved into the hillside. Different types of vegetation lend the landscape its alternating hues. Antelope Canyon, located near Page, Arizona, is the most photographed canyon in the American Southwest. Travellers flock here to capture its masterpiece of colours while admiring its smooth, wave-like texture. Göreme National Park and the Rock Sites of Cappadocia are volcanic landscapes created entirely from erosion. This includes pinnacles nicknamed 'fairy chimneys', which can be seen across this region of Turkey. Meanwhile, the Cappadocia Valley is home to thousand-year-old cave dwellings you can still visit today. The Crescent Lake (or "Yueyaquan" in Chinese) is a fresh water spring in the shape of a half moon that sits in the Gobi Desert. The oasis is believed to have existed for around 2,000 years (though it has seen its water levels decline), and attractions include activities like dune surfing and camel riding. At first glance, the Lencois Maranhenses Sand Dunes of northeastern Brazil look like your average set of sand dunes, but the valleys are filled with water since the low-lying lands often flood during the wet season. Fish even live in the pools. Marvel at Grand Prismatic Spring, located in Wyoming's Yellowstone National Park. As the largest natural hot spring in the US, it's a favourite for its dazzling colours that shift from orange and reds in the summer to green hues in the winter. Whitehaven Beach, in Whitsunday Island, Australia, hosts a cove where the tide shifts the sand and waters together, creating a breathtaking combination. White sands and turquoise waters seem to blend seamlessly to make for a marvelous view. During the wet season, the Salar de Uyuni salt flats in Bolivia are covered in a thin layer of water, creating surreal reflections of the sky. Visit the Zao Onsen hot spring and ski resort, located in the mountains of Japan's Yamagata Prefecture, and you'll see 'ice trees' - trees that pack on heavy amounts of snow to take on fascinating shapes. 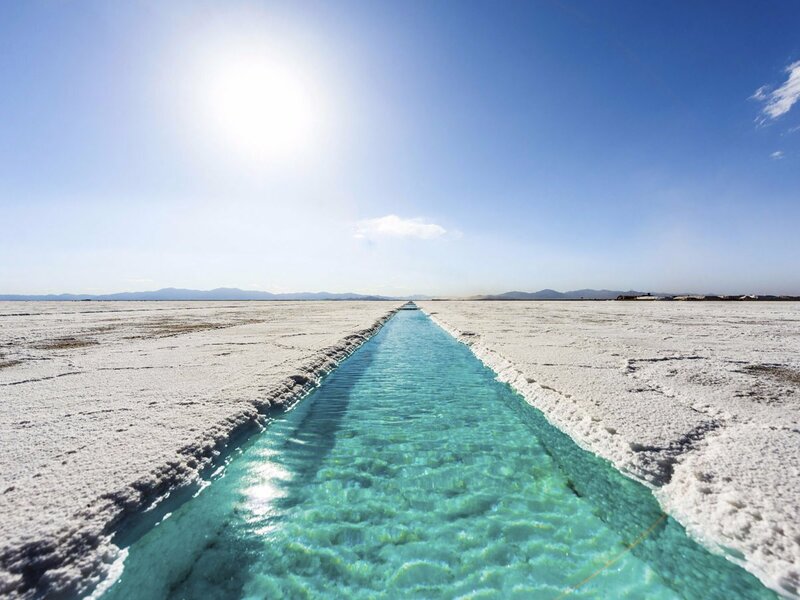 Salinas Grandes is a massive salt desert in Argentina. The field stretches 2,300 square miles (3,700 square kilometres) and includes saltwater pools within its awe-inspiring expanse. The Ta Prohm temple, located in Angkor, Cambodia, is an unbelievably fascinating sight, as huge tree roots dominate the ground and structure, growing sideways along its walls. The Namib Sand Sea, located in Namibia's Namid-Naukluft Park, is a coastal desert. Dune fields often come into contact with fog, creating a unique environment for an array of wildlife. The Kelimutu volcano on Flores island, Indonesia, is home to three coloured lakes ranging from turquoise to a rich green. The lakes are incredibly dense, adding to the striking appearance of their colours, which are thought to be caused by dissolving minerals. The Wave is a sandstone rock formation located in the Paria Canyon-Vermillon Cliffs Wilderness near the border of Arizona and Utah. It's known for its colourful and unique formations and the difficult hike required to reach it, and you'll need to obtain a permit to visit. (Greg Mote/Flickr)Colombia's Caño Cristales is covered in an aquatic plant that takes on hues of red, blue, yellow, orange, and green under different weather conditions. Most of the year it looks like any other river, but from June to December, it is said to look like a breathtaking stream of rainbows. Located in Utah, Bryce Canyon National Park is home to brightly coloured geological structures, which are formed from erosion and called hoodoos. The park hosts the largest collection of hoodoos in the world. The White Sands National Monument in New Mexico is home to the world's largest gypsum dune field. With around 275 square miles (442 square kilometres) of white dunes, the area looks like it's blanketed in snow. The Richat Structure, also known as the Eye of the Sahara, stands as a large bullseye in the middle of the Sahara Desert. With a diameter that spans almost 30 miles (48 km), it is thought to be the result of erosion and stands as a marvel for scientists and travellers alike. Croatia's Plitvice Lakes National Park is both one of southeast Europe's oldest parks and Croatia's largest, with 16 interlinked lakes between Mala Kapela Mountain and Plješivica Mountain. The lakes are surrounded by lush forests and waterfalls, whose waters have deposited travertine limestone barriers for years to create the natural dams. Nevada's Fly Geyser, located in Washoe County, was created through accidental well drilling in 1916. In the 1960s, the water began escaping from the drilled location, creating the geyser that is known for its stunning changing colours. Ice caves that reside within Kamchatka, Russia, come complete with stunning formations and hues of purples, blues, greens, and yellows, which arise when sunlight streams through their glacial ice. Namibia's Dead Vlei, or "dead marsh", is surrounded by some of the highest sand dunes in the world and dotted with dead trees that are more than 900 years old. Megan Willett wrote an earlier verson of this story. It was originally published in 2016.